﻿ It’s easy to see where both sides of the love / hate relationship with Waterparks comes from, more so that with most bands. Yes, there’s a very real obnoxiousness to them thanks to stuffing their songs with piercing electronics and AutoTune, but compared to the other pop-rock bands in their field, they don’t feel as micromanaged, and there’s an intelligence to their lyricism that brings to mind the heydays of Fall Out Boy and Panic! At The Disco, which is far from a bad thing. Maybe it’s the overexposure that came off the back of their debut Double Dare, or a social media presence that tries so hard to pander and becomes really annoying, but people seem adamant to completely look past Waterparks’ positives. So on their sophomore full-length Entertainment, it would make sense to highlight exactly what these positives are, and try and win over the naysayers in that way. Except they don’t really do that. Entertainment is by no means a bad album, but instead of an ambition re-up in terms of sound and focus, it comes across more like Double Dare Pt. 2, variations on a theme but not done quite as well. This is still good though, avoiding the heavy damage that a serious reshuffle could’ve done and instead doubling down on the writing and earworm melodies that Waterparks have excelled at for the longest time. In other words, it’s not going to change the scene to the extent that its predecessor threatened to do, but Entertainment is still far from a sophomore slump. There is one sole change on Entertainment though, and that’s the elements of alt-pop that peppered their debut serving as a more integral part of the sound this time, and it’s not clear whether that was the best option to take, particularly when it’s the isolated element of certain tracks. For one, it’s a really poor use of band resources with tracks like We Need To Talk and Crybaby, which for the most part are drenched in watery synths and popping beats where only vocalist Awsten Knight gets any significant airtime; the only real indication that a band is involved here is a weedy guitar line that runs through the former, but that’s a negligible element at best. And maybe it’s just the bad aftertaste from Fall Out Boy doing the exact same thing, but having synthetic instrumentation alongside production that has no coherent layering doesn’t make for a listen that’s any more appealing. But then again, that is a production style that benefits Waterparks’ more overtly pop-rock side, in that it keeps a bit more gristle in the guitars and fizz in the synths so nothing falls flat. Sure, it’s the same basic approach as was taken on Double Dare, but Waterparks can still make good use of it, with tracks like Not Warriors and Rare having a poppy edge that’s virtually spelled out, but with a sound that actually sounds like a band were responsible for them. It’s interesting to see how the band are experimenting with ratios as well, and how, most of the time, they manage to yield solid results. Of course it’s always nice to see a band with this much mainstream pull expressing their rock side more thoroughly and 11:11 and TANTRUM both tick all the necessary boxes, but with the downbeat, almost R&B-flavored Peach (Lobotomy), there’s an interesting look into just how pliable this band really are, and the directions they can take themselves that shy away from the expected, but still have that Waterparks kick to them. As for the writing, Waterparks aren’t pushing the boat out much here, neither for themselves nor their genre as a whole. It’s another follow-on from Double Dare in looking through a very contemporary pop-rock lens, but as has always been the case with this band, there’s an extra level of dexterity that takes what would be a series a mundane topics – particularly of the relationship variety – and giving them a bit more sparkle. Lucky People might take sappy relationship celebrations a bit too far, especially with its jaunty acoustic guitar and synth chimes, but on tracks like Peach (Lobotomy) and Not Warriors, there’s a far better take on a similar theme through a more grounded tone and Knight’s twisting lyricism. Easily the biggest curveball though, is TANTRUM, a genuine scathing little track that, like Little Violence before it, sees Knight taking shots at those using his and his band’s fame for their own benefit, vaulting over any meek pop-rock peers for a song with real teeth to it. Again, it shows a band who’ve got a lot more below the surface than would initially be picked up on, and highlighting how good it would be for them to embrace it a bit more. Entertainment might have been what was expected next from Waterparks, but it’s definitely a safer effort than it could’ve been, if only the band had more faith in their weirder or more raw affectations. Beyond that though, Waterparks are building a remarkably solid track record for themselves, hitting that accessibility in the right spot, but distancing themselves from the overworked and underwhelming acts that this scene is already too bloated with. Even if changing the formula would be appreciated, Waterparks are taking pop-rock in a bold new direction, and that’s nothing to turn away from. 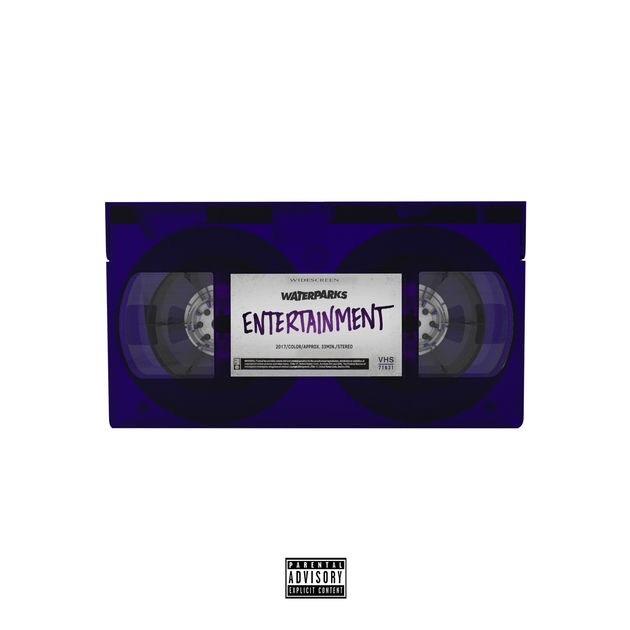 ‘Entertainment’ by Waterparks is released on 26th January on Easy Life Records.